This second volume of the Ticket to Ride Map Collection series includes a double-sided game board with the map of India for 2 to 4 players, plus Ticket to Ride Switzerland, the popular (and very competitive) map for 2 and 3 players. Learn more on the Ticket to Ride India web page. Find Ticket to Ride India – Map Collection Volume 2 at better game stores around the world and also at the Days of Wonder webstore. This entry was posted on Saturday, August 31st, 2013 at 07:09 and is filed under Miscellaneous, News, Ticket to Ride. You can follow any responses to this entry through the RSS 2.0 feed. Both comments and pings are currently closed. 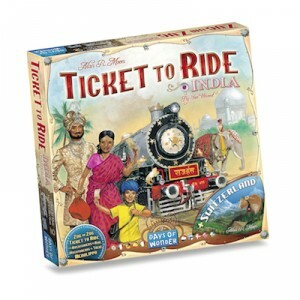 I saw TTR India and got excited… been hoping to see this come to the online game for awhile now. India is by far my favorite map.